Topics: Store Locator, Business Solutions, Ap Custom Systems, Aptitude Family Systems, and Apex Business Systems. 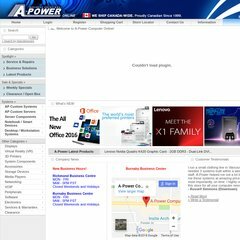 a-power.com A-Power.com - Buy Asus U30JC-A2B Intel Core i3-350M (2.26GHz) 4GB ..
a-power.com A-Power.com - Buy ASUS M4A78LT-M LE mATX AM3 DDR3 AMD 760G 1PCI ..
a-power.com A-Power.com - Buy Asus ENGTX560 TI DCII/2DI/1GD5 SAP nVidia Fermi ..
On average 3.60 pages are viewed each, by the estimated 398 daily visitors. It is hosted by Hopone Internet Corporation Washington, using Apache/2 web server. Its 2 nameservers are ns17.zoneedit.com, and ns8.zoneedit.com. The site is programmed for PHP/5.1.6. PING www. (209.160.41.210) 56(84) bytes of data. A time of 55.5 ms is recorded in a ping test, also its average full page load time is 1089 milliseconds. This is slower than 66% of measured websites.